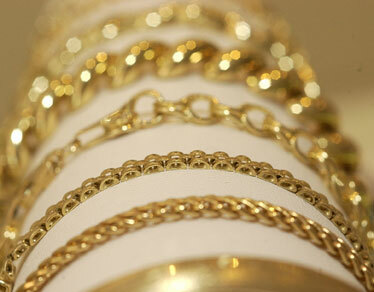 With gold prices rising, some holiday shoppers have reconsidered jewelry purchases. Gold has surged since August, a pace that makes it difficult for jewelers to manage inventory and convey to clients why prices are shifting so rapidly. The global ascent of gold prices in recent weeks has yet to hit the bottom line for isle jewelers, but many retailers are concerned that luxury purchases like jewelry could be the first to get nixed from the holiday lists of middle-class shoppers. Gold prices have surged to levels not seen since 1980 due to strikingly similar worries about record-high oil prices and increasing inflation. Gold's rapid ascent -- from $680 an ounce in August to well over $800 before slipping back to the high $700s -- has been enough to give some shoppers second thoughts about buying jewelry. In Honolulu, newly engaged couples are still walking into jewelry shops looking for rings, according to local proprietors. Michael Han, owner of the Wedding Ring Shop on Kapiolani Boulevard, says the holidays are the No. 1 time of the year for engagement rings. Han says for his store, there is a lag time for adjusting prices, and he doesn't expect it until the end of the year. "What is stable is the labor to make the rings," said Han. "That hasn't gone up, but that's pretty significant in the cost of a ring." Whether consumers choose a band or setting made of white gold, yellow gold, or rosegold -- the gold is actually mixed with alloys, he said, so it's not pure gold that they're buying. In some cases, he said the cost might only be $100 to $200 more. "We have seen gold go up and come back down, but we don't know how long it will stay up," said Han. Most likely, gold will remain high next year, he said. Brenda Reichel, owner of the 20-year-old Carats & Karats in Kaimuki, said the higher market prices will eventually have to be passed on from jeweler to customer. She tries to break the news gently. "If it's an older customer, they're surprised at the prices, and prices for repairs," said Reichel. "The younger folks are being cautious." Given the fluctuations in prices, customers will have to gamble on whether to make a purchase now or later on. In Honolulu, Russell Oshita, president of the Diamond Specialists, said wholesalers are most likely adjusting their prices by the day, given that they have a smaller margin. But retailers have not necessarily begun adjusting their prices yet. He also says the overall price increase for a band -- per gram -- would also be minimal. From his experience, customers usually have a price range in mind when they walk in the door, and want to know all their options, including custom-designed pieces. Platinum, however, has been going up over the last year and a half, so it will be even more expensive than gold. Alternatives to gold and platinum include palladium, as well as tungsten and titanium, now popular choices for men's bands. Despite the fluctuations of the market, retailers say "love" is inelastic. "It's not deterring people from falling in love," said Han. "That part of love is so compelling. It's magical. It makes men do strange things like buy diamonds and gold when they'd rather buy a car." If consumers shy away from gold, smaller jewelers could be hit the hardest -- they're likely to see shoppers migrate to big-box retailers such as Wal-Mart Stores Inc. or department stores like Macy's Inc. The big merchants are able to offer lower prices because of the huge volume of gold that they buy. Higher gold prices don't stop shoppers from buying, "but you may have a customer rethink what they purchase," said Bill Elebash, who runs the jewelry retailer Elebash's in Pensacola, Fla. "They may still buy in the $500 to $600 price range, but they won't buy in the $1,000 price range." Star-Bulletin reporter Nina Wu and the Associated Press contributed to this story.